Click here to register your .tel domain name. In December 2008, it will be possible to register .tel domain names. As opposed to other domain extensions, it is not possible to link a website to domain names of this type. 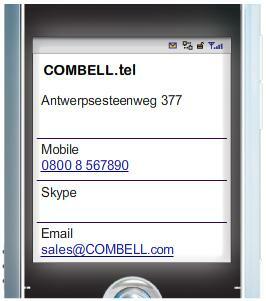 .tel domain names are designed to provide an overview of your contact information. On combell.tel, you would e.g. find an overview of all our contact information, including our physical address, our phone, fax and mobile numbers and our skype, e-mail and SMS messaging addresses. The owner of the .tel domain name even has the possibility to (temporarily) deactivate a certain type of contact information. That way, the owner can choose how he or she can be reached at a certain point in time. The sunrise period for brand holders will start on December 3rd, 2008. On February 3rd, the landrush will start and everyone will be able to register the .tel domain names that are still available. More information on .tel domain names? Check out our .tel portal. Click here.